In android, there are three types of XML parsers to parse the XML data and read them in android applications. Android recommends to use XMLPullParser to parse the XML file rather than SAX and DOM because it is fast. The next() method of XMLPullParser moves the cursor pointer to the next event. Generally, we use four constants (works as the event) defined in the XMLPullParser interface. START_TAG: An XML start tag will read. TEXT: Text content was read the text content can be retrieved using the getText() method. END_TAG: An end tag will read. END_DOCUMENT: No more events are available. In this example, we read the XML data and bind them into a ListView using XMLPullParser. Create the XML document employees.xml in assets directory to parse the data using XMLPullParser. Create a data model class Employee.kt corresponds to the XML data file. Write the code to parse the XML file using XMLPullParser. In this class, we return all the employees in the list. 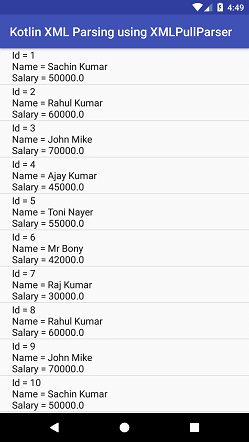 In this class, we send XML data into ArrayAdapter and bind them into ListView.